Swami Ramdev , also known as Baba Ramdev, is an Indian, Hindu swami and an ardent admiror of Swami Vivekananda and Netaji Subhas Chandra Bose. He is particularly well-known for his efforts in popularizing Yoga. He is also one of the founders of the Divya Yoga Mandir Trust that aims to popularize Yoga and offer Ayurvedic treatments. His camps are attended by a large number of people. Over 85 million people follow his yoga camps via TV channels, and video. His yog teaching sessions are for the masses and free for all. His stated principle in life is to be of help to all and as such the sessions are conducted free of charge. Wait. What amm i doing? Talking about baba n cadre on my collegian blog. Have i got into Yoga, or Yog as baba would prefer? nah! i am still the same old Bharat Jhurani, who likes eating pani puri, and loves masala hindi movies. This is just to draw up a link between two very unusual things, and show where marketing can lead to. Creativity. Anyways, now lets talk about Google chrome, yes the google browser that has been making waves within less than a month of its launch. According to statistics reported by Market Share, Internet Explorer lost 1.63 percent of the Web browser market, falling from 72.15 percent to 71.52 percent from August to September. Mozilla's Firefox, which has been hovering around 20 percent in share since May 2008, dipped slightly to 19.46 percent, down from 19.73 percent in August. Google's shiny Chrome browser claimed less than 1 percent of the Web browser market, capturing .78 percent for the month of September. The fluctuations may not seem like much, with IE still dominating the Web browser market. But the numbers are interesting to look at on a monthly basis because they point to overall trends and browsing habits. And the biggest trend right now is that IE is losing some of its market. The numbers from Market Share seem to reflect the need for Web browser companies to always be in front of their users. Internet Explorer can certainly relate. As the numbers continue to fluctuate —and there is no indication that they'll level off—the more visible browsers need to continue to fight to hang onto what they've already established. For Internet Explorer it was Firefox, Opera and Safari. Now that Google's Chrome is in the mix, it will be interesting to see if and how the numbers continue to shift. So, google chrome has indeed been creating ripples. So what? What about Baba Ramdev? " you can't just leave that part dangling" I can hear these anguishes. Here is the link. This picture. Marketing at its best i should say. 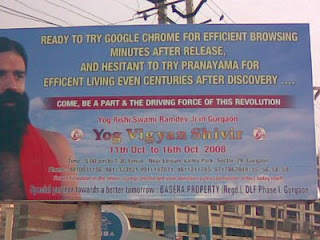 targeted right to the techies of Gurgaon, who in all probability were the first users of Chrome in India, and then showing them a connect to Yog. Awesome Babji, you rock. Only that it would take much more than marketing to convince a marketing student. Maybe a little motivation (not little lots of it! ), and convictioin would pull me towards it. Not marketing for sure. Great new look to your blog...will return from vacation to read more.